ONCE ALL-CONQUERING only realistic rival to the BBC (barring the Pirates, which weren’t exactly state-approved, and kind of fall just outside the three mile exclusion zone-esque limits of the Radio Cream era anyway). The Duchy-centric UK-targeted All Pop And Nothing But service employed washed-up ex-pirates, up and coming new stars and big names who’d got into ‘trouble’ (ie Kenny Everett) to play a mixture of hits and ads, some of the latter – notably Horace Batchelor and his pools-cheating ‘K-E-Y-N-S-H-A-M’-heavy plugs – becoming almost as well known as the pop platters. Fortunes took a nosedive after the launch of Radio 1, and where the station was once big enough to command its own weekly magazine, by the eighties it was struggling to be heard at all (occasioning a series of embarrassing ‘please listen to us’ cinema ads with excruciating “shhh – I think I found ze knob!” punchline), and the 1992 closedown as grimly chronicled for a TV documentary could only muster about three former ‘names’ into the studio to say goodbye. Still, it once formed a pivotal part of the pop firmament, so much so that people get all misty-eyed even when talking about its prone-ness to signal fade. I suspect stereo was the final nail in the coffin for the station – as far as I know it never broadcast on FM. However,the owners of Luxy,CTL,did get involved in another station based in Ireland which frankly,carried on where Luxy ended.It’s name..Atlantic 252. As a kid growing up in the 80’s it really was the best radio out there by far . Times move on but i still think that todays radio stations and their dj’s are well under par compared with the GREAT 208! What happened to the DJs. Although the signal kept fading and coming back this was one of the best stations around in the 70s. Same here, every night i wasn’t out with my mates, it was 208 on the radio. Fun fact – the early Charisma Monty Python albums were recorded at Radio Luxembourg’s London studios. And the naughty kids at school always called it ‘Radio Fucksomebird’. My Dad remembers it as being the only place to hear any pop that the Light Programme wouldn’t play, apart from the pirate stations. Radio Luxembourg was a kind of exotic fix for me in the late ’80s, what with all that Long Wave early evening signal distortion. I listened to Radio Luxembourg on Shortwave 6090kHz(49.26m) and reception wasn’t quite as bad as 1440kHz/208m MW. I well remember tuning in to 208 in early 1984 – about 6 years after I’d stopped doing so regularly/religiously – and the decline in their audience/influence and consequent revenues was shockingly evident. That they weren’t attracting advertisers was the most obvious sign: between January and April it seemed that between every record was played the same bouncy Jordache Jeans ad. They apparently had no others. It must have starting tipping vulnerable listeners to the point of insanity. I endured it for as long as I could as the 208 playlists still beat the competition into the dustbin. What was the music played on the organ, Hammond?, that closed the programme down each evening? The RTL-V/RTL4 astra feed on the Astra1A satellite at 19.2degE via channel 13 gave perfect stereo quality reception all over Europe with better sound quality than 1440kHz MW,and should have been kept going. 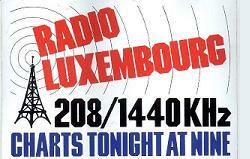 I really miss Radio Luxembourg ! None of the today’s music / hit list- based programs even come close to it. To me the fading and atmosphere disturbances was a part of it, so when Radio Luxy went satellite it became less exotic to me. Last Saturday, after 38 years of searching, I finally found again my above all favorite song played again and again on Radio Luxembourg in 1974: “The man who turned on the world” with The Friends of St Francis. I will never forget the evening when DJ Mike Hollis(? ), brought the Bible and sat down and red the first part of The Creation of the World from The First Book of Moses, while “The man who turned on the world” started up in the background. A beautiful Radio Luxembourg- memory ! connect the stereo phono outputs of the satellite receiver to the AUX in socket on your hifi system with a stereo phono lead, select Stereo 2 7.38/7.56Mhz with the receiver remote control, select AUX on your hifi and there you had it Luxy in superb quality stereo thru your hifi system. Radio Luxembourg on 208m MW/1440kHz AM also went out across the whole of continental Europe with a two aerial set up at Marnach in Luxembourg that combined in the evenings gave an omnidirectional power of 1,200,000watts! During the day the tended to transmit at 600kW via both aerials until they upped the power to 1,200,000watts around 18.00UK/19.00CET for a dutch/international programme, Italian news and current affairs at 18.30UK/19.30CET, German religeon at 18.45UK/19.45CET and the startup of the English Service at 19.00UK/20.00CET. Radio Luxembourg has tried a revival and return in 2005 with a classic rock version of the station using a new fangled digital radio transmission technology that piggyback digital radio signals onto AM called Digital Radio Mondiale or DRM for short. This technology gives near FM quality sound over mediumwave/shortwave and longwave bands and can (with AM propagation) cover large areas or continents using directional transmitters or with a paneuropean reach using omnidirectional transmitters. R.Lux used two frequencies in the 41m band shortwave usually 7295kHz from 9.00UK-15.45UK(10.00-16.45CET)then on 7145kHz from 15.45UK-17.00UK(16.45CET-18.00CET) from various SW transmitters in Germany on directional beams to the United Kingdom, but reception was often dogged with dropouts and occasional deadair moments caused by variable ionospheric conditions on SW. There was also a very low power 0.15kW transmission on 25795kHz SW to Luxembourg City only 24h a day. It was a bit of a folly because there was hardly any special DRM portable radios on the market to receive it;there was only one receiver and that was poor, the Morphy Richards while Roberts MP40 although much better that was supposed to be released never appeared. They hired two DJs with the coolest names on the radio, Emperor Rosko and Tony Prince. I do vaguely remember the Rosko in Exile shows. Luxy’s problem wasn’t a weak wavelength at all-it had a massive 1,200,0000 watts=1200kW in old money which was 600kW individually from each set of aerials (these were combined at night to give a massive reach), and gave a good reach across the whole of Europe and the United Kingdom after dark. The the two aerials were fitted with directional triangular passive reflectors that gave a slightly directional bias to the signal. The omnidirectional AM transmitter on the northern side of Marnach had a single passive reflector which focussed the majority of the signal at the United Kingdom in a west-north-west directional pattern and gave slight attenuation in all other directions while the other omnidirectional transmitter on the southern side of Marnach had 2xpassive reflectors fitted which focussed the majority of the signal in an east-south-east directional pattern at Germany and slight attenuation in other directions. The inverted take-off angle of 1440kHz/208m from the night aerial on the side of the hill on the northern side of the transmitter site tended to skip Luxembourg City and South East England until nightfall but always came through in winter from late afternoons onward as it got dark early whereas the day aerial had a flat even transmission area. I would have left the transmitters omnidirectional with both aerials beaming out equal levels of signal to the United Kingdom and Continental Europe-perhaps the fade wouldnt have been quite as pronounced or as bad if left omnidirectional.